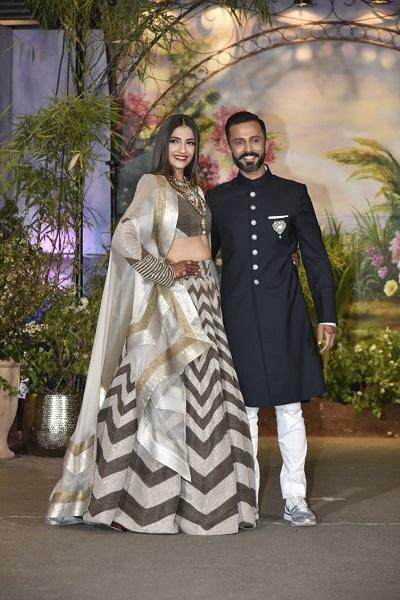 On May 8th, 2018, Bollywood witnessed the big fat Punjabi wedding of Bollywood actress Sonam Kapoor with Delhi businessman, Anand Ahuja. They both were dating each other from quite a long and finally they tied the knot in the presence of relatives and close friends. Their wedding was followed by a reception in which the whole Bollywood industry was invited and was one of the most happening party of the year till now. The Bollywood celebrities were present in huge numbers and what caught the attention of media was the stylish avatars in which the celebrities made their entry. But the star of the evening was the couple Sonam Kapoor and husband Anand Ahuja and their dresses. On one hand where Sonam wore a copper-grey lehenga with a full-sleeves blouse, featured stripes at the hem, a heavy four-tier diamond neckpiece, smokey eyes, bold red lips and cheek fleek hair. Her husband, Anand went into some other way and wore a bandhgala along with sneakers that became a topic of discussion amongst various people on the social media. Everyone wanted to know why he chose shoes that were completely off from his dress and that too on the very special day of his wedding reception. So as per the latest reports that were published in an entertainment portal, it came into notice that Anand is the owner of a clothing brand named Bhane and even has the first ever multi-brand sneaker boutique of India named as Veg Non Veg in Lodhi Colony at Delhi. An inside look from Ahuja's Veg Non Veg showroom in Lodhi Colony, Delhi. Anand, as per reports is a big sneaker lover and so is Sonam. He is quite a lot of time seen wearing the same at various occasions and maybe that is the reason why he wore them at his wedding reception since he wanted to promote them on his special day among various people. Talking about what he did we must say that it was indeed a nice strategy to promote his brand, we must say!